The University of Florida is trying to get special permission from the state to turn their campus into a cemetery, so that they can accommodate all the lunatic alumni who want to be buried there. 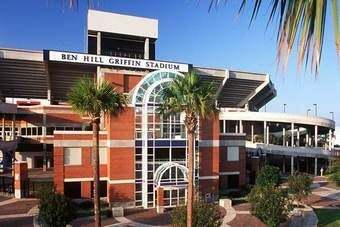 The school says it gets several requests every year from people who want spread their ashes on the football field at Ben Hill Griffin Stadium and that many people have done a clandestine scattering of family remains all over the campus. So they figured, why not build a columbarium—it's like a fancy fireplace mantel—and charge alumni $3,000 to $5,000 a pop to store their charred remains there for all eternity? There is one catch, though. You can't just open a cemetery willy nilly and the university doesn't meet the state requirements for starting their own. So the state legislature—stacked with UF grads, of course—is working on a bill that would grant state schools special dispensation, so that they might better address the needs of insane and rich (but not insanely rich) donors. Not that it will matter much once Tim Tebow returns to campus this fall to raise the dead from their terrible slumber and lead his zombie army to eternal glory. Yes, I believe that's how the prophecy goes.